(Francisco Kjolseth | The Salt Lake Tribune) Publik Ed's, the fourth store for the Salt Lake City Publik Coffee Roasters, opened last week near the University of Utah. (Francisco Kjolseth | The Salt Lake Tribune) Katie Mansfield prepares an order for a customer at Publik Ed's. 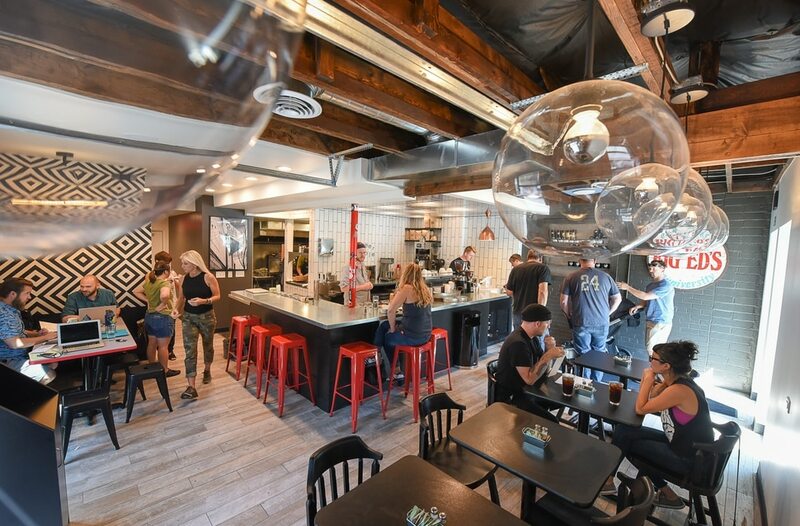 (Francisco Kjolseth | The Salt Lake Tribune) Publik Ed's, a new coffee shop and restaurant, recently opened near the University of Utah, in the space that once houed Big Ed's. 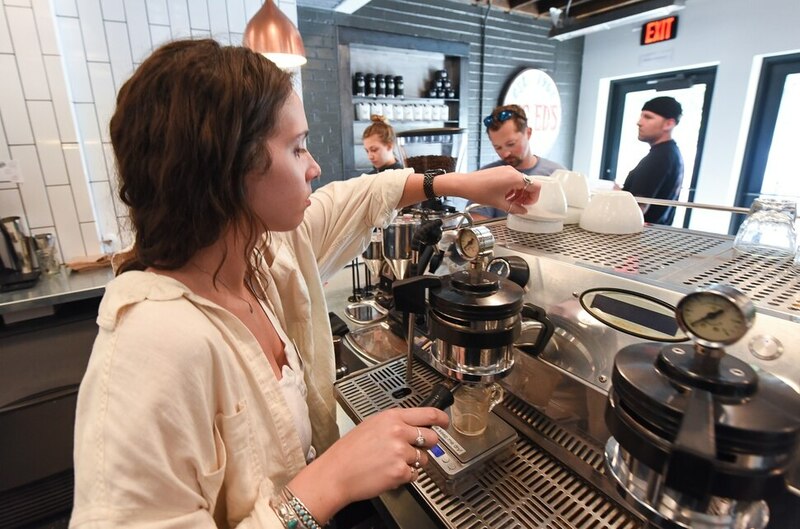 (Francisco Kjolseth | The Salt Lake Tribune) Publik Ed's, the fourth store for Salt Lake City's popular Publik Coffee Roasters chain, opened last week near the University of Utah. (Francisco Kjolseth | The Salt Lake Tribune) Publik Ed's recently opened near the University of Utah, in the same building that once housed Big Ed's. (Francisco Kjolseth | The Salt Lake Tribune) Publik Ed's menu includes an upscale version of the gawdawful breakfast, once served at Big Ed's. The new version is served all day with baked tater tots, house-made chili, pickled onion, cheese and two eggs. Also featured is the two shot espresso milkshake. (Francisco Kjolseth | The Salt Lake Tribune) The wooden sign from Big Ed's hangs near the front door at Publik Ed's, a new coffee shop and restaurant near the University of Utah. (Francisco Kjolseth | The Salt Lake Tribune) A replica of the Big Ed's mural has been incorporated into the south windows at the new Publik Ed's coffee shop and restaurant. (Francisco Kjolseth | The Salt Lake Tribune) To meet state liquor law requirements, the beer taps were placed behind the wall in the kitchen and the pint glasses are served through a window, lovingly labeled the beer hole.” (Francisco Kjolseth | The Salt Lake Tribune) Publik Ed's, a new coffee shop and restaurant near the University of Utah, is bright, and clean with an industrial counter, white tile walls and high-tech espresso and coffee machines. (Francisco Kjolseth | The Salt Lake Tribune) Missy Greis, owner of Salt Lake City's popular Publik Coffee Roasters, talks about Publik Ed's, the newest location near the University of Utah. (Francisco Kjolseth | The Salt Lake Tribune) Publik Ed's, near the University of Utah, is the fourth store for the Salt Lake City Publik Coffee Roasters. (Francisco Kjolseth | The Salt Lake Tribune) Katie Mansfield prepares an order at Publik Ed's, which opened recently near the University of Utah. The wooden Big Ed’s sign hangs on the inside wall next to the front door. The wooden chairs and church pews have been painted black. 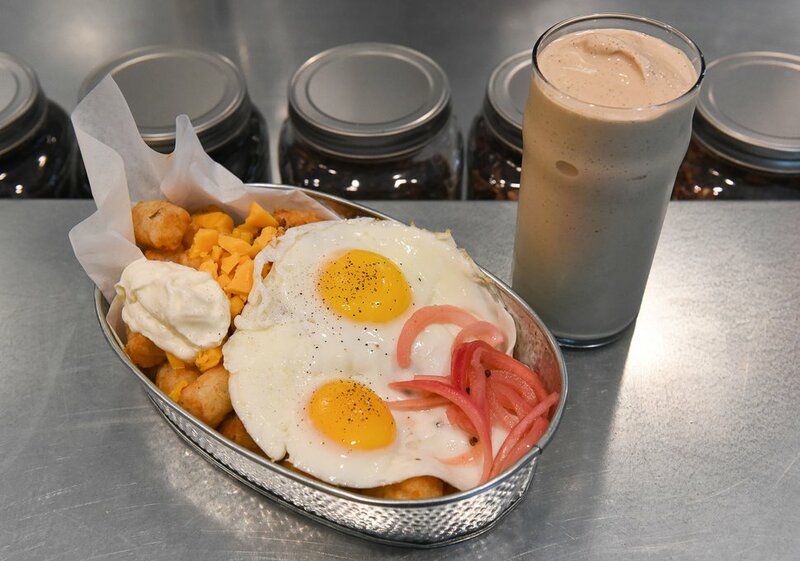 And there is a new version of the “gawdawful” breakfast — albeit with tater tots, pickled onions and creme fraiche — on the menu. 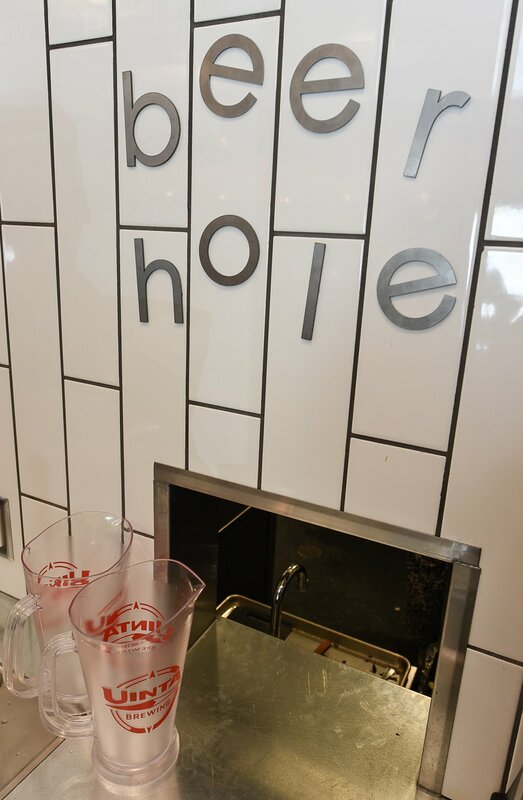 These are a few of the historic touches incorporated into the new Publik Ed’s, an all-day coffee shop and restaurant that opened last week near the University of Utah. It is the fourth store for Salt Lake City’s popular Publik Coffee Roasters, and it has opened — in Big Ed’s beloved spot across from Presidents Circle — just in time for Monday’s start of fall semester. While it pays homage to Big Ed’s, Publik Ed’s looks nothing like its predecessor. “Don’t come in expecting it to be what it was," said owner Missy Greis. The brown-brick building at 210 S. University St. looks mostly the same from the outside. 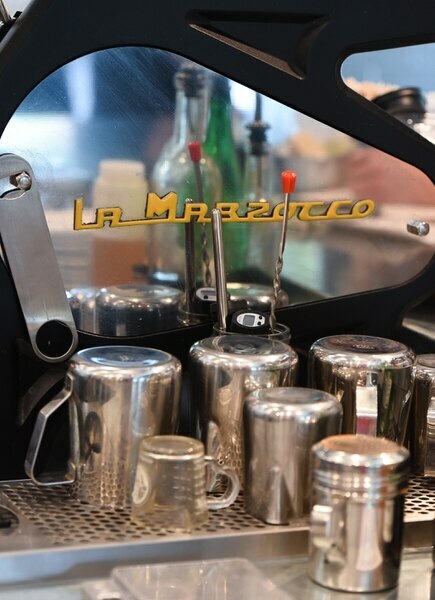 But the inside is bright, clean and remodeled with an industrial counter, white tile walls and high-tech espresso and coffee machines. Big Ed’s, a hole-in-the-wall breakfast, burger and beer joint, mysteriously closed last September after nearly 50 years in business. Joren Peterson, the building owner, said the mother and son who managed the restaurant posted a “Restaurant Closed” sign on the front door and haven’t been heard from since. Peterson contacted Greis about taking over the spot. Initially, Greis wanted to keep the “divey and dark” feeling of Big Ed’s interior, but the building’s age and condition required a major makeover to meet fire, safety and Americans with Disabilities Act standards. The stuccoed wall, featuring an outdoor mural of the nearby mountains and a burger, was in such disrepair that it had to be reconstructed. A replica of the mural was incorporated into the south windows, which had previously been covered up, a welcome find during a remodel that took months longer than expected. The windows add light to the tiny 850-square-foot space that seats 22 inside and another 26 on the outdoor patio — a new feature that Big Ed’s didn’t have. Greis said the previous owners left so quickly that appliances and furnishings remained and could still be reused. Publik Ed’s upcycled the silverware, the glasses, the water pitchers. Even the plastic floral bowls that were once used to serve ramen are now used for house salads. (Francisco Kjolseth | The Salt Lake Tribune) Publik Ed's menu includes an upscale version of the "gawdawful" breakfast, once served at Big Ed's. The new version is served all day with baked tater tots, house-made chili, pickled onion, cheese and two eggs. Also featured is the two shot espresso milkshake. The menu is small but affordable; everything costs less than $10. Breakfast includes eggs, Publik’s popular granola, a vegan waffle made with coconut oil and coconut milk and, of course, an updated version of the Big Ed’s signature “gawdawful” breakfast. Big Ed’s version — a sworn cure for a hangover — included hash browns, two eggs, chili (probably from a can) cheese, onions and sour cream. It was served “all day, everyday." Publik’s updated version is made with baked tater tots — nothing is fried at Publik Ed’s — two eggs, house-made chili, cheese, pickled onions (also made in-house) and creme fraiche. Three burgers — a beef, vegetarian and portobello mushroom vegan version — round out the offerings. Dan Bills, a U. employee, said he frequented Big Ed’s “quite a bit," unable to resist the cheeseburger lunch for $3.75. He decided to check out the new Publik Ed’s — and the gawdawful — on Friday. 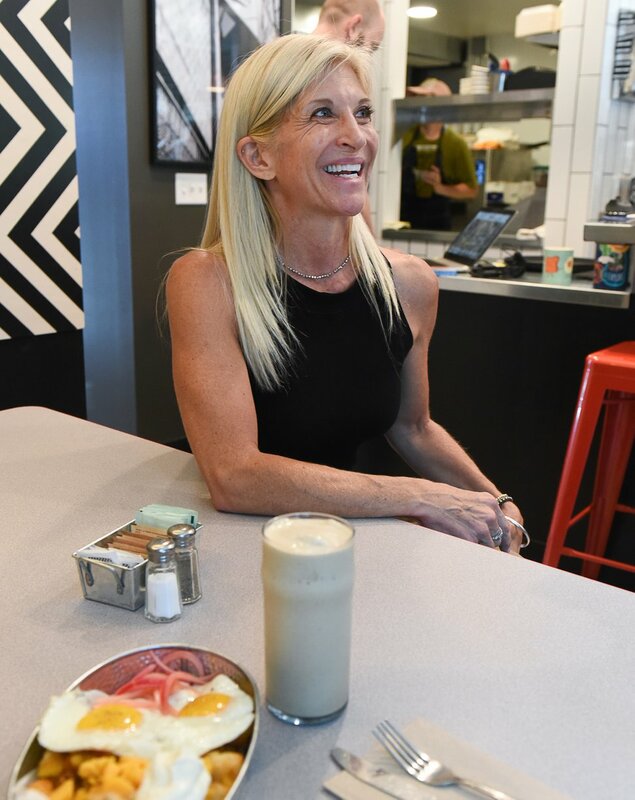 (Francisco Kjolseth | The Salt Lake Tribune) Missy Greis, owner of Publik Ed's, the fourth store for the Salt Lake City Publik Coffee chain talks about the newest location near the University of Utah.